Sauerkraut. Cabbage rolls. Soothing soups. Stir frys. Crunchy salads. Kimchi. And, yes, the ubiquitous cole slaw. These are just some of the ways you can use a hearty head of cabbage that is so prevalent at the farmers market in the winter. But rather than the typical green cabbage that can be so blah, let’s go red! In honor of February being American Heart Association’s Go Red campaign that brings attention to heart disease and how it affects women, the health benefits of red cabbage far outweigh it’s brother or sister, green cabbage. Plus, it’s deeper and earthier in flavor which adds quite a bit more excitement to your plates–both visually and flavor-wise and I like that. Red (also known as purple cabbage) has 10 times the amount of Vitamin A and twice the Vitamin C than green cabbage. Red cabbage is also richer in flavonoid phytonutrients. But the real kicker is that a cup of shredded red cabbage has merely 22 calories and 1 g. protein, no fat, 5 carbohydrates, 1.5 g fiber and 2.5 g natural sugar. Comprised of 90 percent water, red cabbage is a terrific choice to mix in your diet when losing weight or maintaining your weight is a priority. When I was considering what to do with a beautiful red cabbage the other day, I realized that I did not want braised red cabbage. Been there, done that and while it was delicious, we’ve been enjoying (or perhaps not) 70 and 80 degree weather these days. I thought something cold might be more appropriate for this utterly bizarre spring-like weather we’ve been having in late January and early February. 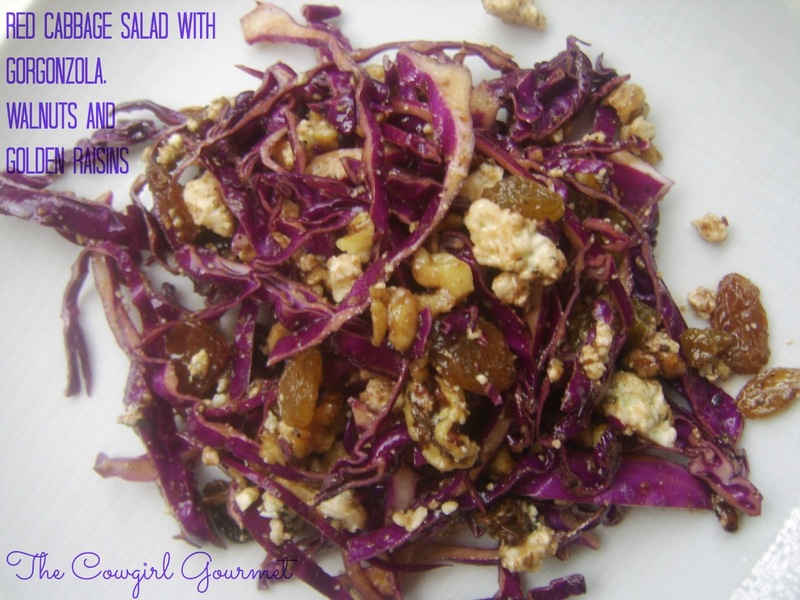 Tossing thinly sliced red cabbage with, get this, crumbled gorgonzola, chopped walnuts, golden raisins and some evoo and balsamic vinegar was an incredible flavor combination. Crisp cabbage, earthy cheese, nutty walnuts and sweet raisins was spectacular and I made it twice. In two days. The trick? Make just enough for what you need as this salad is not as good leftover as it is fresh. In less than 10 minutes, you can be eating this salad and already thinking about when you can eat it again. It's that good. The combination of sweet, earthy, crisp and nutty are incredible. Serve with a sandwich, soup or just by itself. Put the thinly sliced cabbage, cheese, walnuts, raisins, oil and vinegar in a medium bowl and season with salt and pepper. Toss, taste and adjust the seasoning and serve immediately.